Fall 2017 edition of Mystery Tribune Magazine is a must-have! The issue features short fiction from iconic voices such as Lawrence Block to literary favorites including Angel Luis Colón. 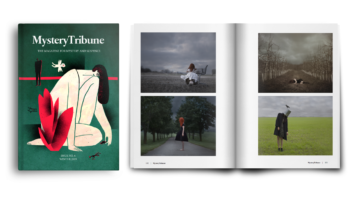 A curated collection of the photography from European and American artists, along with essays, book reviews and interviews by some of the best voices in mystery and suspense are among the other highlights. An elegantly crafted 180 page quarterly issue, and with a beautiful layout designed for optimal reading experience, our Fall 2017 issue will make a perfect companion or gift for avid mystery readers or fans of literary crime fiction. This digital edition will be delivered to you in EPUB format. Stories by Lawrence Block, Angel Luis Colón, Scott Adlerberg, Jim Doherty, and Brian Silverman. An essay on film noir by Robert Miklitsch. Interviews and Reviews by Gunnar Staalesen, Ken Follett and Thomas Andes. Photography by Kylli Sparre (Estonia) and Christopher Rivera (U.S.) and more.